Danhostel Aarhus City is a new and very nicely designed hostel with a cozy roof-top café attached. With its location in the very centre of Aarhus, our guests have the best opportunity to enjoy the fantastic vibe surrounding the hostel. City's Best Prices and Location! Take the elevator to the upper floor and enjoy our sunny rooftop terrace and cafe. We always welcome you with a friendly ‘hallo’ and serve darn good coffee. Our unique panoramic view of Aarhus is absolutely free. We offer several room types to cater for all our guests' accommodation needs. Choose between common dormitories, double rooms and family rooms, all with stunning views of the city's roofs. Cozy, comfy and clean, with a nice relaxed atmosphere. High speed WiFi in both rooms and common areas. 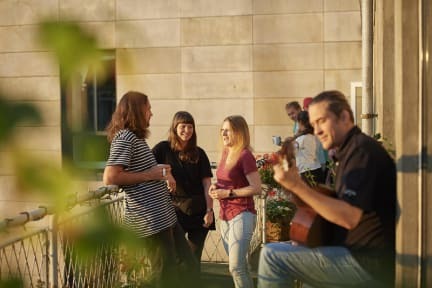 With its location in the very centre of Aarhus, our guests have the best opportunity to enjoy the fantastic vibe surrounding the hostel: The Vadestedet, The Latin Quarter, ARoS, DOKK1, Aarhus Street Food, The Old Town and lots of great activities. Just around the corner is a shoppers’ delight. 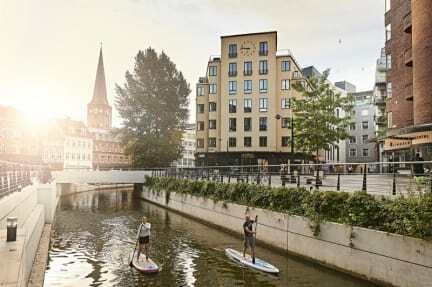 You can take a stroll through the many shops, or enjoy a relaxing meal in one the cool restaurants by Aarhus River. You are just a minute away from public transport. You can also rent a bike and explore the city, or maybe even go to the beach. Opening hours for our reception are 7.00 AM to 21.00 PM. It's a bit expensive for a bed in a 30(? )-person room, but I guess you pay for the great location and terrace.